Associate Professor Joyce Fine, leader of the Reading Education master’s program, helping children at Mirror Lake Elementary learn to read. The Florida Department of Education (FLDOE) ranked the Reading Education master’s program at FIU’s College of Education as the No. 1 teacher preparation program in the State of Florida. The rankings, which were issued for the first time by the FLDOE, are based on the success of students who graduated from each program. 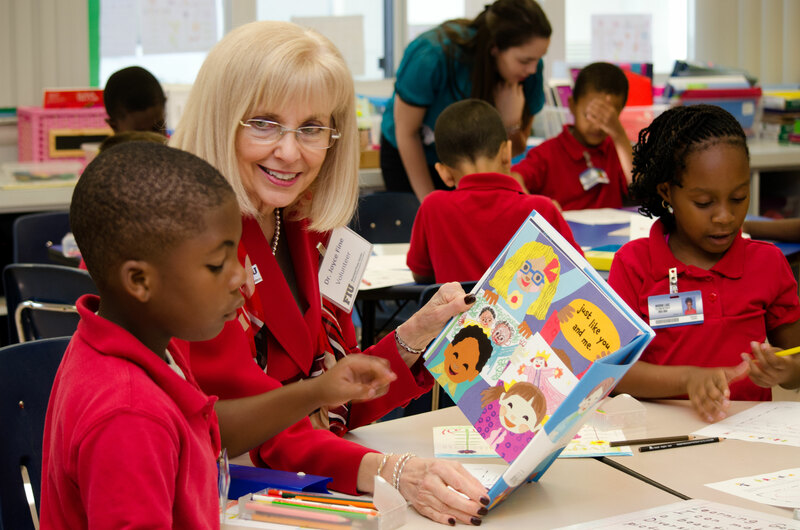 FIU’s Reading Education master’s program was the only teacher preparation program in Florida to earn maximum scores in the areas of student achievement on statewide assessments; student achievement on statewide assessment by subgroups; teacher annual evaluations; teacher retention; and teacher placement. Garcia and the faculty point to the rigors of the graduate reading program as the reason why its graduates are so successful. Teachers in FIU’s graduate program learn to assess and instruct all students – including those who are in special education and ESOL programs– based on their needs. They complete internships at the elementary and high school level to more effectively motivate and engage students in grades K-12. College of Education faculty who teach in the program are active in the field and continuously review the program to incorporate the latest research and best practices in reading education. For example, instructors use the latest methods and technology including smart boards and iPads to teach comprehension and problem-solving tasks. The full DOE Annual Performance Program Report is available here.